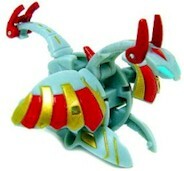 Altair is a mechanical bakugan made by professor clay. Although, I don’t personally like buying mechanical bakugan, it is relatively strong and is worth buying. I got mine for $3.25 on eBay, and any Altair can combine with a WIRED which is another mechanical bakugan, so it makes it even more valuable if you have a Wired already. Purchase Altair from Amazon now!